While our Travellers are exploring the prison, interviewing staff and prisoners alike. their ship, Le Suroit, is being transported to the inner planetoid belt for its refueling and refurbishing for the next leg of the journey. The primary reason is that Cyan and the Way Station are moving further apart, and the 1G lab ship will take too long to get there if they wait much longer. 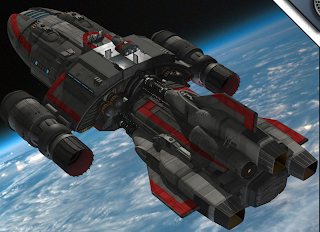 The 2nd reason is that I may as well use the deck plans I've bought over the years, so the Renegade class Scout ship (which is 4G as of now :) ) is waiting to take them to the station when they have completed their jobs on Cyan. And I've got the Renegade from 0-Hr / Ryan Wolf, both the deck plans and the miniature.